So, one of the many joys of being at Rhinebeck this year was getting to meet so many people that I’ve only known online previously. There was a lot of “squee”ing and hugging and laughing. It was just awesome. She remembered my mentioning an offhand comment on the boards that I was a fan of ribbon yarn (which I am). She had this Crystal Palace Deco Ribbon (color #121) that really didn’t appeal to her, thought of that comment, and when she saw I was coming to Rhinebeck, she brought it for me. Isn’t she a total sweetie? Actually, yarn present aside, she really is a total sweetie. It was awesome to get to chat with her while we were there. And I don’t know about any of you, but I have major plans for tonight. Swing your razor wide, Sweeney! 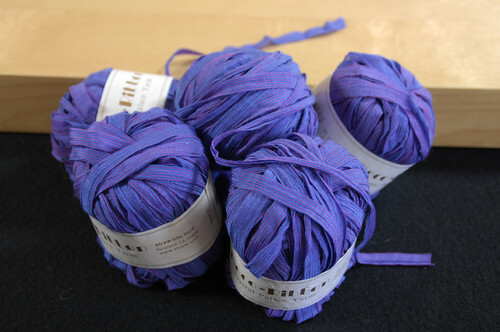 December 21st, 2007 | Tags: Knitting, Rhinebeck, Yarn Acquisitions, Yarn Pr0n | Category: Misc. at last! my arm is complete again! Oh and beautiful yarn! How sweet! thanks for refering us to the review of Sweeney Todd. I wasn’t going to see it, but will now! I’m amazed that Johnny Depp has turned into such a good actor. Xiris doesn’t know it yet – but I’ve arranged for a babysitter for a WHOLE day so we can drive into the city to have dinner and see this movie… for our anniversary. ooh, nice! 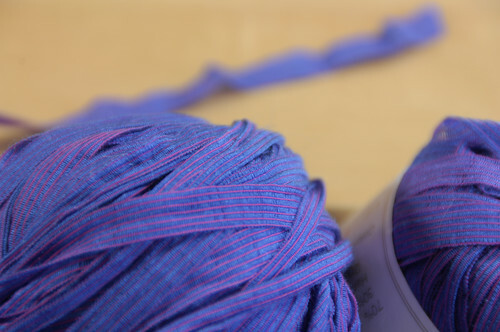 I like ribbon yarn too, although I’m never sure what to make with it. I want to go see this too, but I’m so not into going by myself. I’m going to have to do some fast talking I think. Enjoy! That is a beautiful colored yarn! Don’t you just love the knittyboard vibes! I’m excited for Sweeney Todd, too. But I’m gonna have to wait a while–Enchanted just finally got to my theatre, so this will be some wait . . .
Sweeney has always been my favorite musical, I don’t quite dare see this movie. I’m afraid I wouldn’t like what they did with it and get really bummed. Did you love it as much as I did?? I’m so happy they didn’t make a horrible film out of this musical.. there are things I’d change, but all and all I loved it. OK, so how’d you like the movie? Emily and I are going to try to see it tomorrow. Yes, I know it’s rated R and she’s just short of being 15. According to the reviews I’ve read, the R rating is due to the gore factor, and I think Em will handle that better than I will.